Like the Trowbridge letters, we saw this little tiny item sporadically through the years and had no idea what it was or who made it. At one point we’d magnified it and realized it was the Lord’s Prayer in minute script. Well, the other day, I took a closer look since I was wondering if somehow this came to Uzal Trowbridge in a letter. After all, it would seem normal for someone in his family to send him something small and special like this so that he could keep it with him during his military service. As I looked at the bottom, I made out “Written without [could not make out straight away] by MA Honeywell”. Well, my first reaction was to be disappointed that it was created by someone named Honeywell and not an ancestor of mine. Then I was wondering what the word next to “without” was. And as I looked more closely, I thought it said “hands.” Well that’s strange, I thought–“without hands”–someone without hands made this?! Amazing. So, of course, I was keen to figure out who MA Honeywell was. So I searched for him/her on Google, and imagine my amazement to get hits on the name straight away. I was even more amazed to read who MA Honeywell was. It turns out that MA Honeywell was Martha Ann Honeywell of Lempster, New Hampshire, who was born in 1787 without hands, forearms, and a foot. On the one foot she did have, she only had three toes. With her toes and mouth, using pens and scissors, she created silhouettes for which she became quite famous. 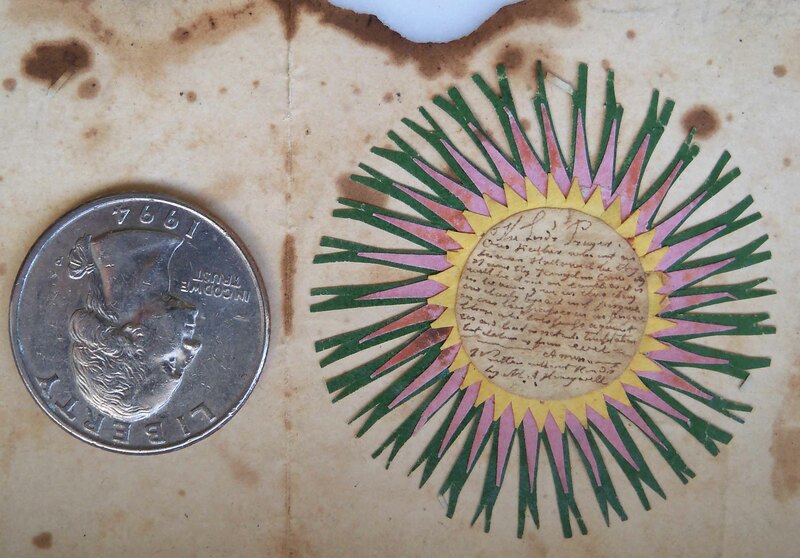 She also did needlework and paper cutouts and specialized in writing the Lord’s Prayer on dime-sized circles of paper which she placed in elaborate cutout paper frames, like the one seen here. From 1798 to 1848, Miss Honeywell traveled around the United States and even Europe, making public appearances during which she demonstrated her talents and sold her creations. 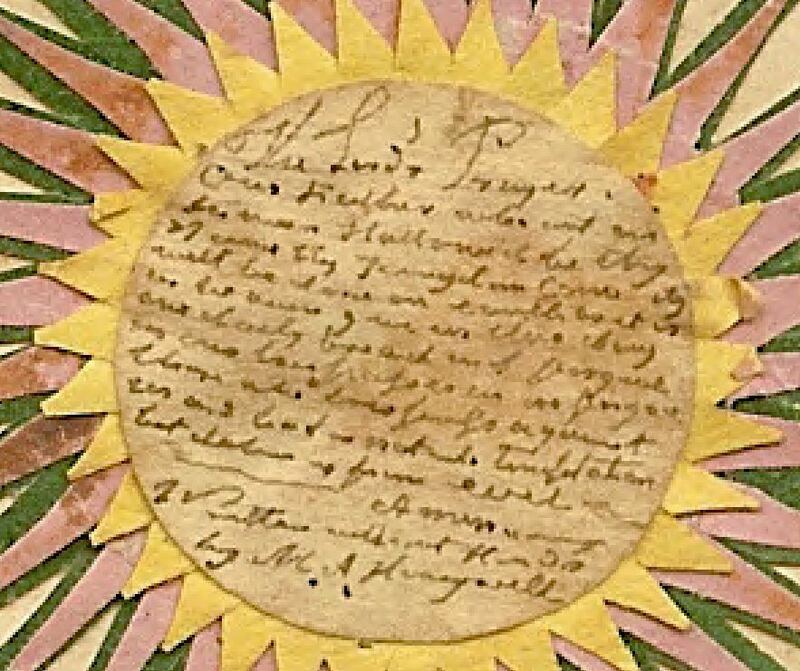 For a mini-bio of Miss Honeywell, see the Encyclopedia of American Folk Art. Apparently there were a small number of other armless silhouette artists working during that era, but Miss Honeywell was one of the few women doing so. (on Google Books), that provided what could be a clue: “In August 1828 she began a long run at the Peale Museum in New York, lasting until 1830.” New York City is just across the river from Union County, NJ, so perhaps one of our ancestors ventured into the city to see her at the museum. In any case, neither Uzal nor Henry Trowbridge, who were both born after Miss Honeywell’s passing, appear to be linked to this amazing little piece of artwork. Nonetheless, it’s a wonderful slice of history and I am so glad to have discovered it. Carrick, Alice Van Leer. Shades of Our Ancestors. Boston, 1938. Groce, George C., and David H.Wallace. The New-York Historical Society’s Dictionary of Artists in America 1564–1860. New Haven, Conn., and London, 1957. Rifken, Blume J. Silhouettes in America, 1790–1840: A Collectors’ Guide. Burlington, Vt., 1987. Rumford, Beatrix, ed. American Folk Portraits, Paintings, and Drawings from the Abby Aldrich Rockefeller Folk Art Center. Boston, 1981.